The right live auction packages can turn a fun gala into a truly exciting one. Your most loyal supporters deserve the best, right? After all, your nonprofit’s annual gala is the event of the season. Your community looks forward all year to the festivities — the dinner, the music, the ceremonies — but most of all, the live auction! 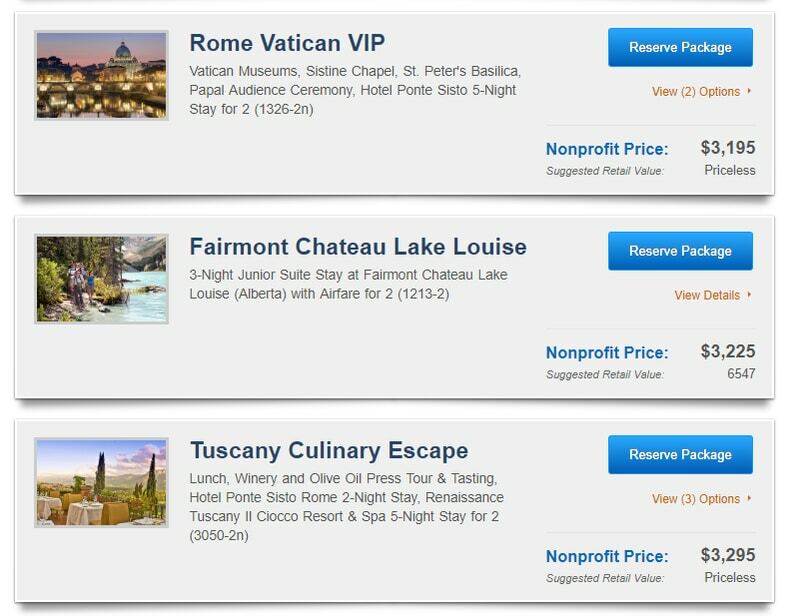 Live auction packages in these categories consistently perform very well for nonprofits. They get donors excited, boost engagement at your event, and (most importantly) they offer great returns! The king of all live auction packages — a luxury vacation to an exotic or exciting destination! The right vacation package will be a major attraction of your gala, sure to increase attendance and engagement. The thought of winning a luxurious escape to somewhere they’ve never been before is the perfect way to get the crowd buzzing with excitement right before your auction begins! Tropical getaways. All-inclusive trips to the Caribbean, Cancun, or the South Pacific are guaranteed crowd-pleasers. Outdoor adventures. Skiing or hiking trips in the US, Canada, and Europe are classic choices. Or consider an African wildlife expedition! World-class cities. Offer exciting vacations to the world’s most amazing cities like Paris, Rome, New York, or Tokyo. Historical voyages. Your donors might jump at the chance to win a guided an Irish getaway or Tuscan culinary tour. The key to securing an amazing luxury vacation package for your next live auction or gala event? Partner with an experienced booking and concierge service like Winspire. If you’re using charity auction software to help plan and execute your event, ask your vendor about their preferred item procurement partners! Partnerships like these can save your nonprofit time and money while boosting donations and engagement! What better way to get your gala attendees excited than offering them to chance to live out their dreams? Give your donors the adventure of a lifetime with an incredible experience package. Think about your major donors and event attendees. What are their interests? Their hobbies? Think carefully about what will get them really excited and eager to place their bids. Kennedy Space Center astronaut adventure. Chances are some of your donors always wanted to go to space camp as kids! VIP Broadway experience. A 3-course meal, VIP tickets to the hottest show in town, and a backstage meet-and-greet are sure to generate some buzz. High-flying adventures. Hang gliding lessons, hot air balloon rides, and fighter pilot experiences are all great live auction packages for your adventurous donors. Silver screen cameos. Organize a walk-on role, dinner with the director, and full tour set for your donors interested in film and TV! Again, we recommend contacting your charity auction software vendor to discuss any of their existing partnerships with auction item procurement or package booking services. Consignment-style deals can provide major savings and returns for your auction! Your team might need to get a little creative with this one, but live auction packages that provide year-long benefits are extremely popular with donors! Plus, this idea is more flexible for organizations of all sizes than more luxurious packages might be. Date nights for a year. One lucky winner will receive 12 dinner, wine, and entertainment packages — one date night each month. These can be as high-caliber as Broadway ticket packages or as accessible as gift certificates to local restaurants and theaters. Concerts for a year. Contact a local music venue — rock or classical, your pick — and discuss setting up a 12-ticket bundle package. Your donor will have an exciting new musical experience to attend each month for a whole year. Oil changes for a year. Maybe it’s not as exciting as rock music, but this live auction package is extremely practical! Organize a package deal with a local, well-reviewed auto repair and oil change shop. Your busier donors and frequent travelers will love this one. Massages for a year. Who wouldn’t get excited about this package idea? Find a local massage therapist to partner with and offer one lucky donor a monthly massage for a whole year. These live auction packages all rely on your team’s ability to get creative and find the right partners. To include one of these packages in your next live auction or gala event, plan ahead! Many local businesses will jump at the chance to promote their services and offer your donors year-long perks. This is another extremely flexible auction package idea for your next gala. Partner with a local catering company, restaurant, or event venue to offer donors unique catered party packages. Catered Thanksgiving dinner. One happy winner could win an incredible Thanksgiving dinner to share with friends and family! Consider Christmas, Hanukkah, and New Years celebrations, too. Superbowl Sunday tailgate party. Organize a catered package that includes professional grill masters, a huge projector to screen the game, lawn chairs, and an empty field or parking lot. Your winner can invite all their friends for an amazing Superbowl Sunday. Crawfish boil or pig roast luau. Give your donor an incredible themed party to share with their friends during the hot summer months. A low-country boil with all the fixings or an amazing assortment of luau food could be perfect ideas. 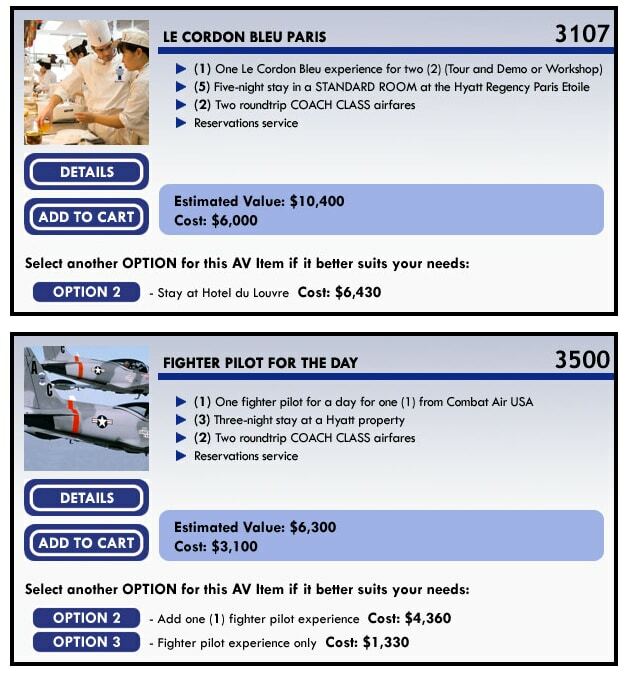 As your organize the auction packages, think carefully to adjust them to your donors’ preferences. For instance, would your average gala attendee rather host their catered party at their own home or at a larger venue? Contact local catering companies to discuss any package deals that they might already offer. Lessons from professionals are a surefire way to catch the attention of attendees at your next live auction and gala. Depending on your organization’s connections, your community, mission, and the interests of your donors, a learn-from-a-pro package could be a very high-performing item! Golf lessons are a particularly reliable and high-performing live auction package idea. Many organizations consistently reach their goals by offering pro golf pointers as an auction item in a larger golf tournament fundraiser. A classic auction item idea for nonprofits of all missions and sizes, the tried-and-true themed basket is an old favorite. Themed baskets are an extremely flexible way to offer live auction packages. You can fine-tune the right level of luxury or practicality to suit your donors and the nature of your event. Then get creative to come up with the perfect themes to catch their attention! These packages can make great items for both your live and silent auction events. Spa day. Think soaps, facial masks, robes, and maybe even a “massages for a year” package! Who could resist? Camping adventure. A top-of-the-line tent with sleeping bags, water bottles, maps, and lanterns might get your donors very excited. Coffee connoisseur. Create a basket of professional-grade coffee brewing equipment with high-quality beans from around the world. Wine and cheese lover. Charcuterie goods like cheeses, meats, and pickles plus fine wines make for an extremely appealing basket. Depending on your budget and the scale of your auction, consider presenting some of your big-ticket live auction packages within baskets. For instance, your local winery tour could be packaged in a wine and cheese lover basket, or incorporate a yearly benefits package as discussed above in Idea #3. Artwork and culture-related items are old standbys when it comes to live charity auctions. They’re an especially reliable way to attract the attention of more traditional major donors. Rare or valuable artwork or antiques. Season passes to a theater or a membership at a local museum. A personalized museum or gallery tour. Signed entertainment or sports memorabilia. Tickets to a stand-up comedy show or major pop concert. Arts and culture items make excellent cornerstones of larger live auction packages. Tickets to a major exhibition opening at the local art museum could be paired with dinner reservations and transportation for the night. A signed football goes great with season passes! Get creative to package your items in ways that generate more excitement, but make sure they still remain reasonably-valued for your event’s target donors. Another classic live auction staple, fashion and designer goods regularly attract the attention of extremely generous donors! To get started, work with an auction procurement service, or try researching your options on your own. Reach out to local designers and vendors to gauge their interest in partnering for a charitable cause. The positive promotion that auction events provide are often a strong motivator! Plus, remember that fashion and designer goods make great online auction items, too! Find a top mobile bidding software that lets you fully customize your listings and packages. Sometimes it feels like electronics rule our lives. We do so much with our smartphones, tablets, and laptops, it can be a major inconvenience to use outdated or broken electronic tools. Why not offer your donors the chance to win a new high-quality tech tool in your next live auction or gala event? Solicit items from local vendors or partner with a procurement service to help find electronics items on consignment. Next, create some auction packages! You might bundle a new TV, speakers, and wine and cheese basket as the ultimate movie night package. Or maybe a fancy new camera, gift certificate to local a sporting goods store, and a trip to a national park could be the perfect wildlife photography package! Fancy (or not-so-fancy) auction nights are a classic fundraising idea for schools, too! Creating live auction packages for school and family events, though, requires that items have a broader or more kid-friendly appeal than many traditional auction packages typically do. Get creative! School auction packages can be perfect for engaging the families in your community. Plus, supporting their child’s school while winning a special treat or perk for them is a major motivator for generous parents! Feel free to adjust the logistics of your auction event, too. Raffles and penny socials make for great school fundraising. Keep exploring with even more live auction packages and ideas if none of these examples immediately jumped out at you. 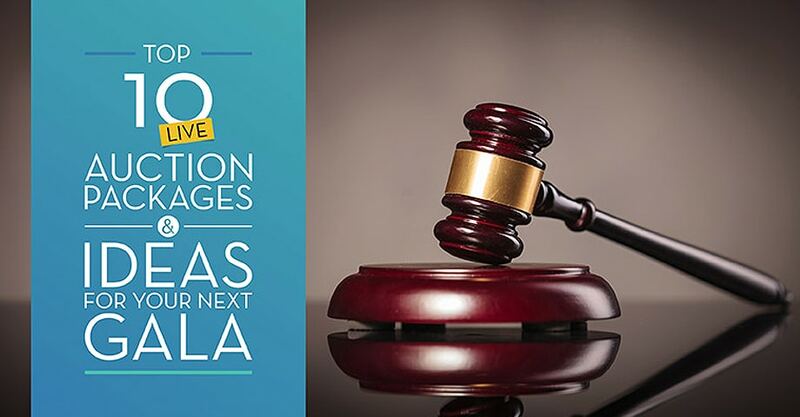 Remember, though, that the main categories of auction packages outlined here represent some of the most reliable, exciting, and high-performing ideas for all kinds of nonprofits. Top 7 Silent Auction Software for Nonprofits [Reviewed!]. A well-planned silent auction makes an excellent addition to any gala. Get started with the right software. Top Eventbrite Competitors from Double the Donation. Event planning software needs to accomplish a lot. Make sure your team is using the right tools. What is Peer-to-Peer Fundraising? A Nonprofit’s Guide. Peer-to-peer fundraising campaigns often conclude in a major event like a gala or auction.